walkway at Phillip & Sala Burton Academic High School. The San Francisco school board will ask voters on Nov. 8 to support the third and final installment of a 10-year, $1.3 billion effort to upgrade and renovate every one of the district's 132 schools. 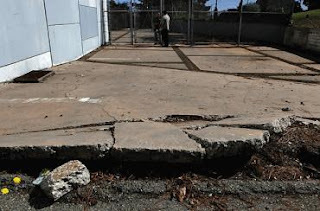 The $531 million bond on the ballot, Proposition A, would cover the costs of fixing the 53 aging schools still on the district's to-do list, including a teardown and rebuild of the Willie Brown Jr. Academy in the Bayview. The new 20-year bond would cost property owners up to $21 per $100,000 of assessed value - although given low interest rates, district officials expect the actual cost to be around $10. "The only upside in this whole economy is that a dollar goes a lot farther in the school building business," said David Goldin, district chief facilities officer. "It's great for us." The two previous bonds approved by voters - $295 million in 2003 and $450 million in 2006 - have paid for renovations at 90 schools. The work included court-ordered upgrades to disabled access points; improved heating, lighting and plumbing; and full face-lifts for each school inside and out. Total costs to property tax owners have been $29 per $100,000 in assessed value, well below the initial $60 estimate. As is the case for the previous bonds, there is no senior exemption attached to Prop. A. The two previous bonds were passed before the recession hit in 2008, but district officials are cautiously optimistic that San Francisco voters, who have consistently supported schools at the ballot box, will approve this measure as well. The only opposition comes from the Libertarian Party, which noted that bond funding in the past paid for repairs on schools that were closed soon afterward. That indicates a lack of planning and foresight, party officials said. "Bonds are for major expenses like constructing new school buildings," the Libertarian Party wrote in ballot arguments against the measure. "That isn't needed now." Yet many of the district's buildings haven't been upgraded for fire and safety, wiring and other systems since the 1950s, officials said.